Guest Post Stop 11: What’s Chaz Planning to Do About Shia? Hello there! 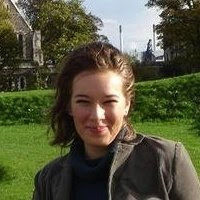 Jess Haines here. 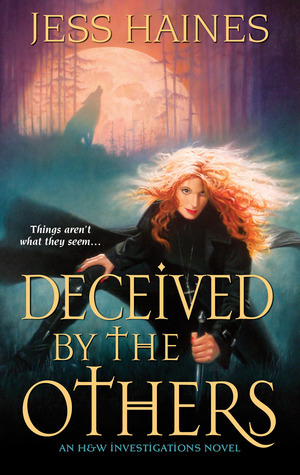 I’m the author of the urban fantasy H&W Investigations series (HUNTED BY THE OTHERS, TAKEN BY THE OTHERS, DECEIVED BY THE OTHERS, and the upcoming STALKING THE OTHERS /to be released on July 3rd!/). Shiarra has been having a pretty bad time of things lately. She’s here with some of her friends (and otherwise) to tell you about it. This time, the H&W gang are going to grill Chaz about his plans. Over to you, Shia! Chaz: I thought that was pretty clear. Shiarra: I didn’t. Why the hell were you messing around on the side if you wanted me to stay with you? Sara: I’ve been pretty curious about that myself. Chaz: This isn’t something I want to talk about in front of them. Arnold: You did a pretty good job of making it public when you picked someone like Shia to cheat on. Royce: Indeed. I would imagine choosing a private investigator to cheat on has to be one of the least intelligent choices I’ve yet seen you make, dog. And I’m aware of quite a few additional errors than I’m sure the rest of our present company have been made privy to. Shiarra: What a sec, how do you know more about that than I do? Royce: Ms. Waynest, the things I know that haven’t been made general knowledge to the public would turn that fire-red hair on your head white. Sara: Am I the only one dying of curiosity right now? Chaz: I’m not sure I want to know. Shiarra: The suspense is killing me. Throw us a bone here, man. Chaz: Stop. Whatever it is, don’t say it. Arnold: Hey, now. Let the vamp speak. We want to hear what he has to say. Chaz: If he talks, I’ll rip his throat out. Shiarra: Whoa, whoa, whoa. What the heck has you so riled up? Royce: I imagine he feels he has a great deal to lose by letting any of the information I have on him made public. A violent reaction is hardly unexpected. Royce: Try it, dog. You know you can’t win against me. Chaz: Oh yeah? Let’s take it outside and find out. Sara: Cripes, you two are such children. Enough with the posturing. Arnold: Can’t live with us, and all that. Sara: You’re nowhere near as high strung as those guys, honey. I’m not worried about you. Royce: Perhaps you should be, Ms. Halloway. Your beau is far from perfect. Arnold: Nope. Doesn’t mean I want you to be the one to tell my girlfriend anything about me. If she’s going to hear it, it’s going to come from me. Sara: Uh… is there something I should know? Arnold: It’s Other business. We can talk about it, but not here. Sara: Should I be worried? Arnold: Hey, dead man walking? Remember that part where I said this stuff should come from me? Shiarra: Damn it, I feel like everyone’s getting to hear about the good stuff but me. Chaz: Why the hell does the mage get a free pass? Arnold: Because the skeletons in my closet are nowhere near as numerous or damning as yours? Sara: More likely because you’re willing to be more forthcoming about them than he is. Shiarra: Someone going to let me in on the secret later? Arnold: Shia, as much as I like you, you’re not my girlfriend. I’d rather keep some stuff private. I’m sure you have secrets you’d rather none of us knew, right? Shiarra: Okay, point taken. I’m still going to wonder every time I see you, though. Royce: Secrets are inherent in the mystique of Others. It’s part of what attracts humans to us so readily. Chaz: Yeah, and if we’re going to keep that mystique, some of us need to shut our pie-holes before we ruin it for everyone else. Shiarra: Chaz, you lost your shot at keeping those secrets under wraps when you started dating me. Chaz: You didn’t catch on that I was Other until I changed into a wolf in your living room. Shiarra: That’s beside the point! Also, you had the worst timing in the history of ever to show your Other nature to me. Sara: I’m not surprised she didn’t catch on sooner. We were right in the middle of a very busy season. Thanks again for having me and the gang over, Stella! Once, she was one of the good guys — or as close as a New York P.I. can get. Then Shiarra Waynest was drawn into the world of the Others. Every faction has its own loyalties and agenda. And Shia’s recent betrayal by her ex-boyfriend means that she may be on the verge of becoming a rogue werewolf at the next full moon. 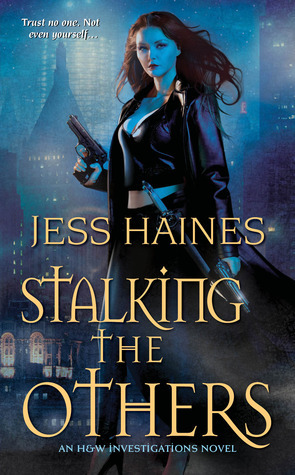 You are in luck because there are TWO giveaways where you could win a paperback copy of STALKING THE OTHERS, Book #4 in the H&W Investigations series by Jess Haines! 5 lucky entrants will win a paperback copy of STALKING THE OTHERS! Giveaway is open to US/Canada and GB residents, ends on 22 June 2012! 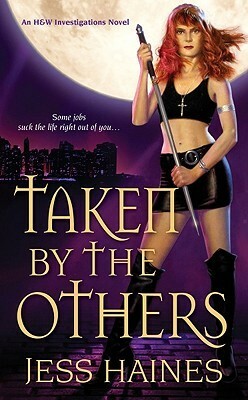 Kensington has offered 15 copies of STALKING THE OTHERS to those who enter the Rafflecopter form below! All you have to do is fill out the Rafflecopter form. This giveaway is open to US/Canada shipping only and ends on 19 July 2012!